These Epicure went into the ground nearly two weeks later than the Swift that were our first earlies last year but the first harvest is only a week later. I don't think that the Epicure are a week quicker to mature, just that the weather has been so much better this year. The long hot and dry spell has ended today. I spent a final few hours quickly trying to plant out the second sowing of beans, which have only just germinated in pots, the climbing cucumbers and the Madeira Vine, which is going to share a wigwam with the cukes. 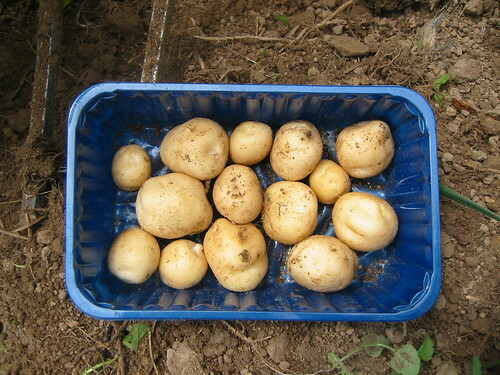 There was nearly 100% germination of the beans in pots which indicates there was nothing wrong with the seed, it must have been some awful disaster, a touch of frost in the night or mouse attack that caught the first sowing out and made for such a poor show. Fingers crossed nothing dreadful happens to this batch. I couldn't face trying to start them again. Also rushed into production because of the forecast for heavy rain; the elderflower syrup. I see Niles has posted his recipe which I think is based on the Sophie Grigson one from the Beeb. I prefer this version from Anne's Food. 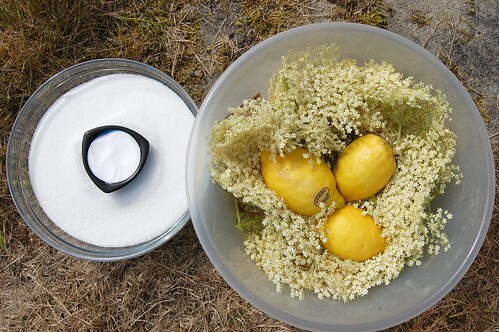 Elderflower syrup is intrinsically Swedish to me and because this recipe uses much less citric acid, I find it's a much more pleasant flavour. I'm going to bottle the elderflower champagne later. It's not looking brilliant, but I'm hoping the fizz will come and I have to get it off the flowers now or it will start to go off. That's only 45 days from planting to harvest! thank you for reminding me to plant more beans! and my friends have masses of blossom on their elder tree so i may try making some of the syrup. Do make some syrup Joker, it's lovely.